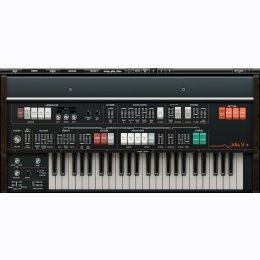 From a very long time, this wonderful and versatile machine was used by a lot of well know artists and musicians, from a long time now, a lot of computer users have been waiting to have this as part of their sound arsenal. After more than one year of intense modeling deep in the basement of the Xils Laboratories, they can now offer you this complete recreation of a legend. Its unique vintage vibe and beauty that can only be brought back to life by precisely emulating different vintage techniques. T.O.D : The Top Octave Divider Oscillator provides a unique sound that sampling or other simple synthesis techniques can reproduce. Emulating the T.O.D, without any aliasing on the whole frequency range, with its pitch and waveform modulation, was a real challenge, worthy of XILS-lab. They are very proud of their effort and offer it to you for your inspiration and enjoyment. XILS-lab touch : The XILS V+ would not however be a real XILS-lab instrument if we did not add a lot of functions and possibilities that were not present in the original machine, some giving access to its internal circuitry and parameters. And some being totally new. One finely tweaked and emulated Top Octave Divider aliasing free oscillator, providing up to 49 voices of polyphony. A finely tweaked analog-like pitch tracker. XILS V+ is iLok or eLicenser protected: YOU NEED EITHER AN ILOK OR ELICENSER DONGLE TO AUTHORIZE XILS 3 !! !